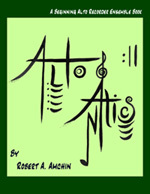 This is the beginning alto recorder ensemble book. Interesting percussion parts and Orff instrument accompaniments makes this a book your students will love. Notes are introduced sequentially and the pieces go from very easy to intermediate. This book will never have to leave your repertoire!